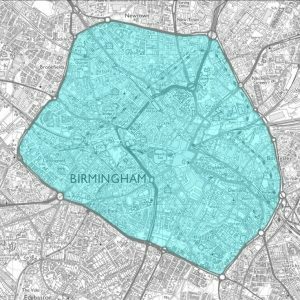 Birmingham City Council has revealed it plans to introduce a new Clean Air Zone (CAZ) in the city, from January 2020. The new CAZ seeks to help the city reduce levels of NO2 and will operate 24 hours a day, seven days a week, covering all roads in Birmingham City Centre. Charges set out under the scheme range from £8 per day for LGVs and taxis (Hackney Carriages & Private Hire), to £50 per day for HGVs, with no charge for motorcycles, mopeds or scooters. For further information on the Birmingham CAZ, click here.